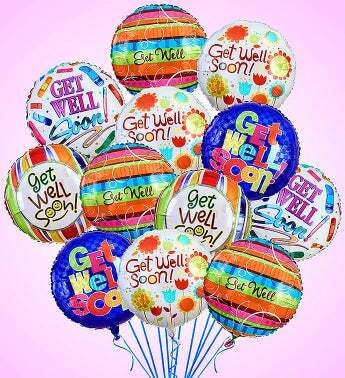 Lift their spirits with our fun-filled "arrangement" of Get Well Mylar balloons. Gathered by our select florists, it's a truly original way to brighten the mood and send a smile when they're feeling a little under the weather. Lift their spirits with our fun-filled arrangement of Get Well Mylar balloons. Gathered by our select florists, it's a truly original way to brighten the mood and send a smile when they're feeling a little under the weather.